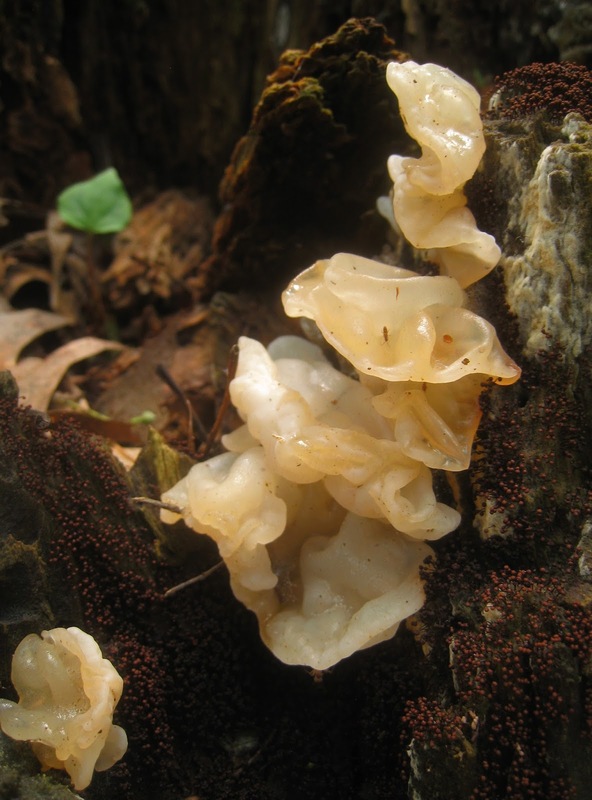 "Distinctive" features: growth in dense clusters, habitat of disturbed ground, white spore print. I think it's one I'd like to try at some point, but only after further study. This particular patch was also much oranger than I've usually seen, maybe because of all the heavy rain we've had. 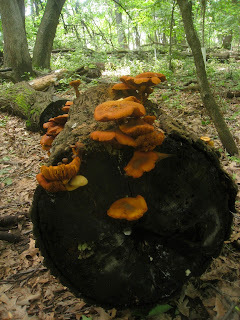 But notice the smaller, yellow mushroom growing on the top, left face of the log. It has the appearance of G. junonius growing under dryer conditions. It was smaller than most of the rest of the group, and the veil was still covering the gills, so it probably sprouted a few days later. Or could it be another species. A long with being an impressive mushroom visually, G. junonius often has a very distinct almond extract smell. This patch was particularly fragrant.